History is fun—especially when middle-grade and young adult authors get their hands on it. 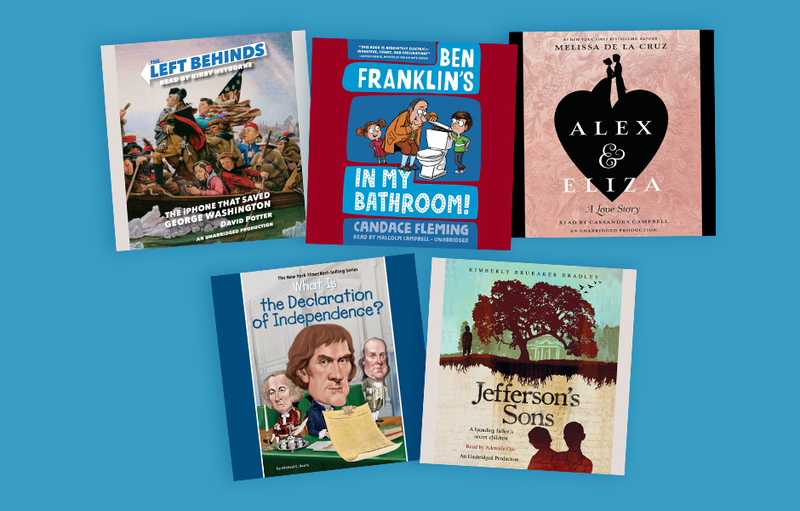 Spend some time this Independence Day listening to amusing audiobooks that will get kids to add history to their list of favorite subjects. A humorous time-travel adventure about an iPhone malfunction that sends three kids back to 1776 in time to rescue George Washington. History meets hijinks when Ben Franklin accidentally time travels to a ten-year-old’s home in 21st-century America. Listen to an excerpt Ben Franklin’s in My Bathroom! From a New York Times‒bestselling author comes the love story of young Alexander Hamilton and Elizabeth Schuyler. Discover the true story of one of the most radical and uplifting documents in history, and follow the action that fueled the Revolutionary War. Listen to an excerpt What Is the Declaration of Independence? Told in three parts from the points of view of three of Jefferson’s slaves—Beverly, Madison, and a third boy close to the Hemings family—these engaging and poignant voices shed light on what life was like as one of Thomas Jefferson’s invisible offspring.